Description: This is a plastic train set with a hand-operated crank handle on the accessory train station that moves the train around the track. 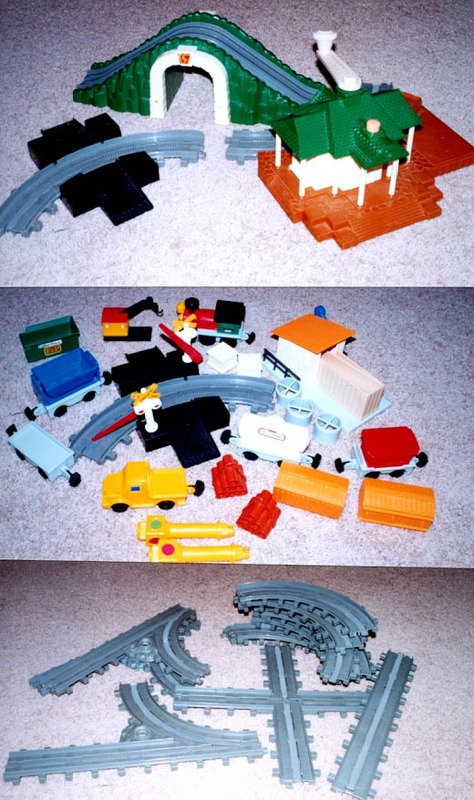 Each piece of track has a white plastic center that moves and makes the train move. The set includes a train engine and caboose, 3 rail cars and 4 interchangeable trailer bodies, a working railroad crossing, a barrel loader and barrels, a combination tunnel/hill, and more! Designed for children ages 3 to 7 years old. FPT19275 - 4 each - Grey curved track. FPT19276 - 1 each - Grey straight piece. FPT19277 - 2 each - Grey track pieces with a fork in the track (shaped like a Y). The center of the fork has a platform with a hole in the center that accessory signs can fit into. FPT19278 - 1 each - Green combination hill/tunnel with "FP" above the tunnel portal. The hill has grey track over the top. FPT19279 - 1 each - Grey intersection track (shaped like +). The center of the + shape does not have white track. FPT19280 - 1 each - Brown base train station. The station is white with a green roof. There is a white hand crank on top of the roof that makes the train move on the track when turned. The front of the train station has an attached curved grey track. FPT19281 - 1 each - Grey curved track with a black railroad crossing on each side. Each side of the track has a black ramp for the accessory vehicles to cross. Each ramp has an X-shaped imprint and a "STOP" imprint on the end. Each side has a hole for the accessory railroad crossing signs. FPT19282 - 1 each - Grey base train engine with a red boiler, green cab, black smoke stack, and 6 black wheels. FPT19283 - 1 each - Grey base caboose with a red top. FPT19285 - Green trailer with an open top and raised sides. This car has a litho on the side marked "F&P". FPT19286 - White water tank (shaped like a gas tank). FPT19287 - Light brown trailer with wood-simulated sides and roof. FPT19288 - Blue bucket with a blue frame (resembles a hammock frame). The bucket tips to dump cargo. FPT19289 - 2 each - White railroad crossing signs with a round base, 2 red "lights", a yellow X-shape above the lights marked "RAILROAD CROSSING", and an attached red arm that lifts and lowers. These signs fit into holes on the black railroad crossing ramps on each side of the curved grey track mentioned above. FPT19290 - 2 each - Yellow signs with a red light on two sides and a green light on two sides. Each sign has a round base that fits into holes in the center of the 2 forked grey tracks mentioned above. FPT19291 - 2 each - Black crossing gates with yellow yield stripes across the gate. The gate has a hole in the end that the yellow sign mentioned above can fit into. The sign base fits into the crossing gate, then they fit into a hole in the center of the forked grey tracks mentioned above. The crossing gate and sign directs the train to either the left or right track in the fork. FPT19293 - 4 each - Grey hollow plastic barrels with a thin "X" on the end of each side of the barrels. FPT19295 - Small white building (Barrel loader building) with a light brown slanted roof on top. This building has a blue hand crank on the side that loads the accessory barrels into the train cars. This building should be elevated with 2 accessory grey risers. FPT19296 - 2 each - Grey risers with X-shaped support beams, and a tiny ladder on the side for imaginary people figures. FPT19297 - Yellow crane with a red roof, and a black crane arm with a black plastic hook on the end that lifts and lowers. The hook is sized to hook onto the loops on top of the accessory pipe bundles and crates. The crane has a black rectangular base that fits onto a rectangular area on the train station base. The crane can pivot on the black base. FPT19298 - Yellow plastic pick-up truck that rolls on 4 black wheels. The front window area has a litho with a driver at the wheel, and the sides have a blue square litho for side windows. The truck has a Velcro® brand fastener on the back to pull the train cars off track. This set was sold in a 17-1/2" long, 28-1/2" high, 7" deep box with a carry handle.